It is official, I have SABLED - quilt fabric Stash Accumulation Beyond Lifetime Expectancy. I just came into possession of a copy box full of fabric for $40. Mainly lavendars and Christmas fabric, I am happy I have enough for numerous projects. 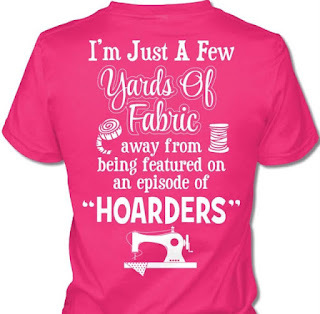 I was in town for the mom angiogram and she mentioned there was a lady in her mobile home park that had come into possession of a quilter's stash. It all went down like a illegal trade, we popped by her house unannounced, went into a back room, and at first she said she didn't have any material left. She had second thoughts and decided to part with her lavendars. A few moments later, an entire box of Christmas fabric appeared, she was willing to part with that. Mom inquired who it was that gave her all the fabric but the fabric hoarder stasher wouldn't give up that info. 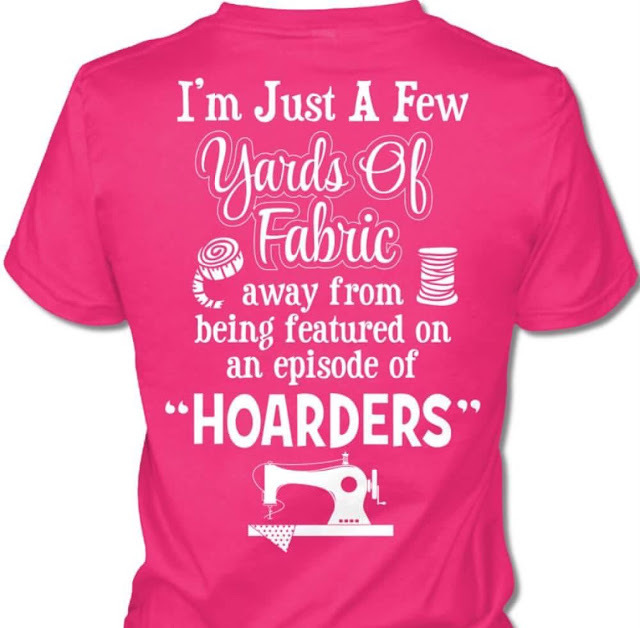 One thing I have discovered and find quite humorous, is the fabric obsession quilters seem to have or at least acquire. My goal has always been to acquire fabric at the lowest cost possible. With this latest purchase, I estimate I gained at least $200 worth of fabric at retail valuation. The sewing machine injury to my left index finger is coming right along and it may be that I will have no long lasting effects from that accident. Good thing, otherwise I wouldn't know what to do with myself and my quilting obsession. Q2 goal is to utilize some of my thrifted Hawaiian shirt hoarder material to make a Daughter quilt. What are you passionate about? What would you do if you had to give up a favorite hobby? Concluding the story began on this post Lost-and-found-and-fortune-teller. Madame Fortune Teller had decided to accompany Rag Tag man on his search for Cupid. 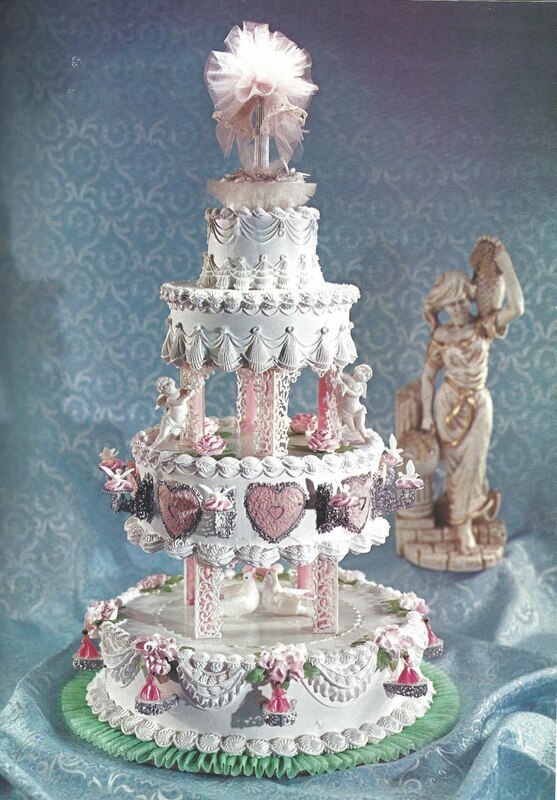 The gods of the netherworld wanted Cupid back, especially for Valentine's Day, where he was needed most. The two in search of Cupid morphed through the magical mirror to the underworld. Who else could be holding Cupid hostage? There were the usual suspects, Lucifer and his legion of demons, but what could they possibly want with a little nymph man armed only with love tinged arrows? Maybe Cupid decided to go on a bender. He had been at this love business since eternity began. Maybe Cupid was looking for Ms. Cupid? It is possible he accidentally fell onto one of his own love arrows. Did he take out a personal ad or post an online profile? Cupid - avoids walks on the beach and direct sunlight, is constantly armed, prefers punctures over bites and is clothing optional. Back to the business at hand, Madame and Rag Tag were now in the depths of the underworld. They were using invisibility cloaks to move past the nefarious sorts, the evil ones who continued their bad deeds in the afterlife. They came upon a gatekeeper so they put their cloaks aside for a moment. Madame spoke first, "Gatekeeper, can you direct us to the Teller of All? We are in search of Cupid, we fear he has been abducted." Gatekeeper pointed to a dark abyss and chorkled, "Take your chances there." Madame and Rag Tag exchanged fear-tinged glances and proceeded toward the abyss. Madame whispered to Rag Tag, "When I say 'now' we will veer off to the left, down the corridor of hate and self loathing." Rag Tag didn't question, he merely followed in silence. They found themselves in a large circular room at the end of the corridor and there they burst into a song by Captain and Tenille, Love Will Keep Us Together. In the midst of their song, they heard a sound, a voice joining them in the chorus ... the voice of a male other than Rag Tag man. Madame yelled out, "Cupid, is it you?" Cupid cried from behind one of the doors, "It's me, it's me! Help. It is Valentine's Day and I need to work my magic." Madame and Rag Tag hollered back, "We are here! Let's spring you out of this place!" So they busted down the door, grabbed Cupid and put on one of the invisibility cloaks. They made their way back through the underworld to the Earth's surface and the day was saved for lovers everywhere. On to other news - I finished the Corn Crib quilt for my mom's birthday this month. I'm not sure if I was a success at free motion quilting (an example in this quilt), as I severely injured my left index finger in a sewing machine accident. My online Computer Information Science class continues but there is nothing of note to post. It is a class that I can work ahead, which came in handy when I was laid up with the bum hand. I am busy composing AtoZ Blogging Challenge posts, a mere month and half away beginning April 1. There is still time to sign up as a participant A-z-challenge-sign-up-list-2016. As of this post, there are over 700 bloggers in the mix. I am joining up on Visible Monday with Notdeadyetstyle to showcase an armload of clothing thrift shop finds for less than $20! First up is this Pendleton lightweight jacket, I was thrilled to score for $1. Sometimes the volunteers don't know what they are pricing and it was $1 men's shirt day, this lil darling-a medium ladies shirt jacket. The Royal Robbins polyester dress was also on the dollar rack. As a Seattle native, this Space Needle t-shirt was of particular interest to me, behind it a Joanna polyester black and white polka dot shirt. Danny & Nicole dress will join my Fun Floral Friday collection and this Metro Style button up collared shirt is right on trend, I am seeing a lot of this orange color. Still adding to my t-shirt collection, no reason to pass them up at $1 each. My adult daughter said her boss told her she needed to dress more professionally at work. She said to me, "I need to dress more like you mom." I was more than happy to hear those words as I like to wear cute ensembles at work. I found these two outfits for her in my commando thrift shopper haul. A Toni Garment jacket and skirt set for $1. The PS Sport short sleeved shirt ($1) and the most was spent on a $5 Worthington red knit skirt. 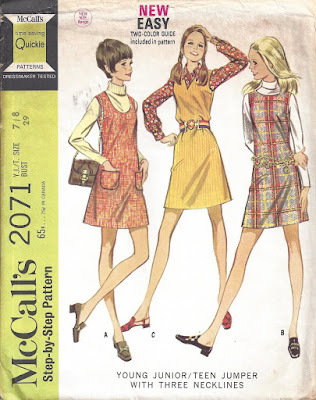 It wouldn't be a fashion linkup without a Pattern of the Day from 1969, oh how I love these retro looks. 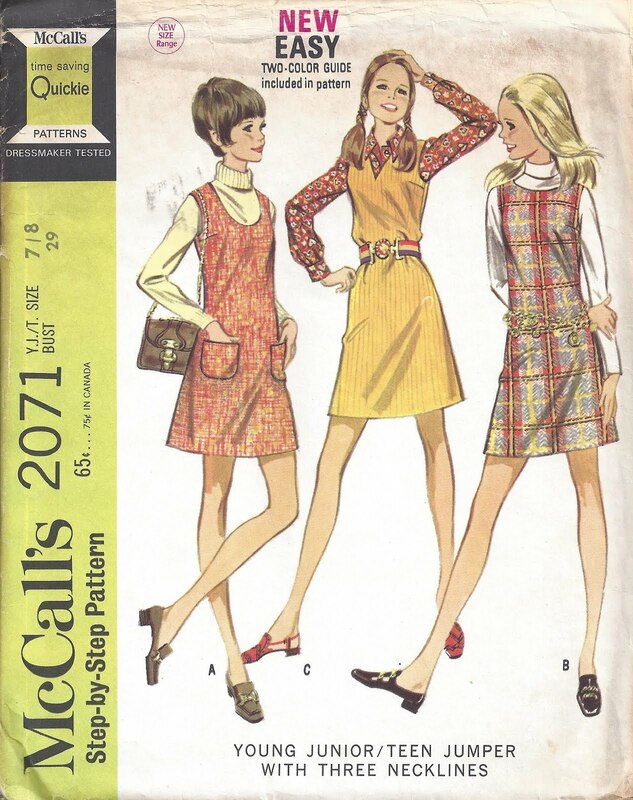 I remember wearing a jumper similar to the one in the pattern. 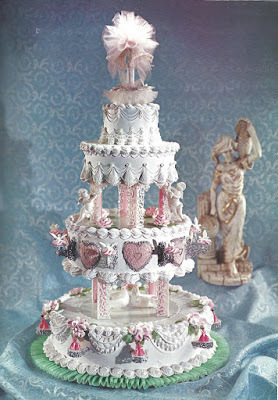 Heck, lets end on a happy note - come back on Valentine's Day for the conclusion of my story, Where in the World is Cupid? Here I am in hot pursuit! One of my favorite activities is to combine blog hops, the more diverse the better, but my search was in vain this year, lost in the ether that is the blogosphere. I dug down in the Tami archive to revive a character that could and should make an appearance in this Lost-and-found-blog-hop. 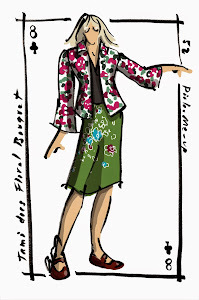 Madame Fortune Teller, as she preferred to be known in the traveling circus, didn't intend to make a career of reading Tarot cards but she came to enjoy the camaraderie of clan. They were the last of the modern day gypsies. She could come and go as she pleased, no one need tell her when to take a break, or how to wear her hair. There was a freedom in not being corporate. Besides, she was still young, plenty of time to plan for retirement. Her day was proceeding along with the usual readings and common questions, "Will I meet someone?" or "Is there money in my future?" when a small, oddly-dressed man entered her tent. "What is it you seek today? Answers to love, money or career?" He answered, "None of those." He reached into his coat that was threadbare with more patches holding it together than original material. "I need to find someone but not in the usual way that one would think. I need to employ a different method for a person not of this world." Madame blinked not once but twice. Did she hear him right? Was he "all there?" "Did you say 'not of this world?'" "Yes," he replied. "We fear in the netherworld that Cupid has been abducted. Love has been languishing. There are less and less marriages. I have been sent down by the Gods to restore human faith in love." "Shut up!" Madame exclaimed in a way that meant she didn't believe him, rather than don't say any more. "This has got to be a joke!" "If only it were not true. I have no where else to turn. Your turn at the cards could reveal clues to where he is or who is detaining him." She pondered this turn of events. She did have one deck of cards different from the traditional Rider-Waite. Perhaps they held the clues for this rag tag gentleman. She retrieved her Steampunk Tarot deck and collected her fee from him. The three cards she drew confirmed what the man had told her. The first card, the Wheel of Fortune mean that something had happened that made no sense and could not have been foreseen. The Nine of Pentacles represented Cupid as an accomplished and self-made forest nymph. The Five of Wands meant the gods were looking to regain what was taken from them. "Let's try again. If we could know which direction to look, I will draw three more cards at no additional charge." The next set of three was the Eight of Cups, first card drawn. The meaning that there will be something left behind to search for something else. "The gods mean for you to join me in my search!" Rag tag man exclaimed. Madame frowned and pondered this. "Let's move on to the second card of Judgement." Her heart jumped when she realized what that card meant, a core meaning of hearing and heeding a call. The third and last card was the Four of Swords, her interpretation was to take time out for a divine message or solution, still the swords, still the mind. The problem continues to exist but can be seen from a different perspective. "I will help you. We still lack the clues to find Cupid. You can stay at the tent down the way, just tell them I sent you. We can start our quest in the morning." He smiled faintly, "Do you believe we will find Cupid in time for Valentine's Day?" Madame Fortune Teller replied, "We can sure try!" To be continued, check back on February 14th for the conclusion of Where in the World is Cupid?